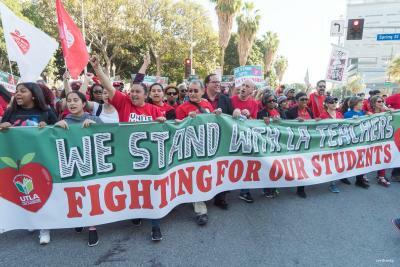 What is Janus vs AFSCME? Stay informed! Subscribe to receive email updates. After almost two years of contract negotiations, teachers and LAUSD have not been able to reach an agreement. Teachers are fighting for lower class sizes, more nurses and counselors, and greater investment in our kids. That’s why they began striking on January 14, 2019. 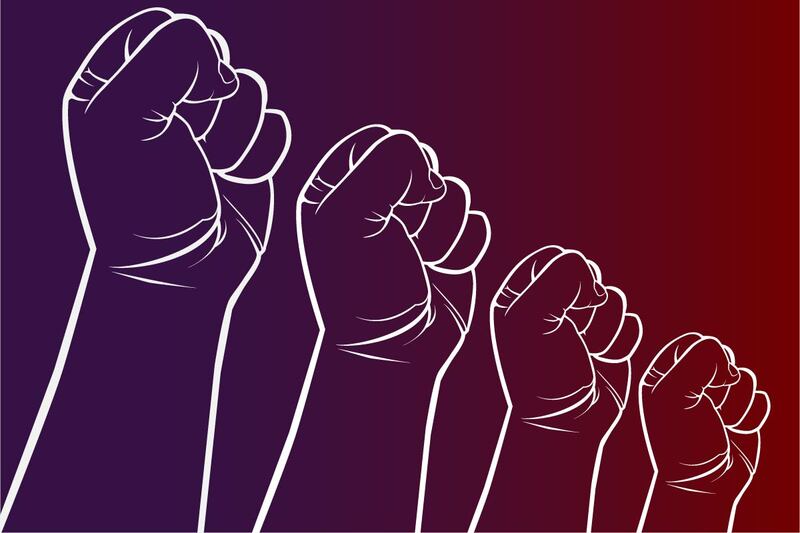 We know the power of workers making the courageous decision to strike in order to be heard. We know that we can only ensure a quality education for all students when we stand together. That is why we support teachers in their fight for the schools our students deserve. 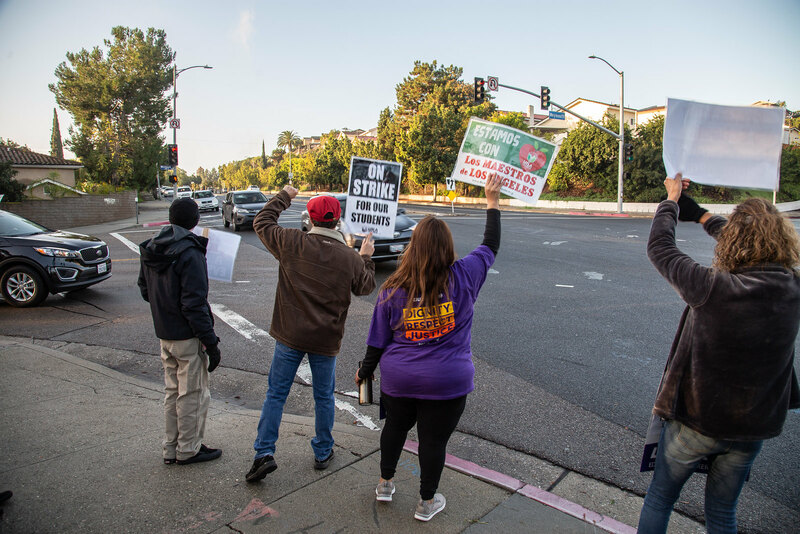 SEIU Local 99 members at several schools have led sympathy strikes—when one union strikes in support of another—in solidarity with striking teachers. Many more members have expressed an interest in sympathy striking at their school. It is still possible to hold one. If you are interested in leading a sympathy strike at your school, please click or tap on the button below to let us know. An organizer will contact you to talk about the process and go over your rights and the potential risks. At least 80% of your co-workers must commit to a sympathy strike by signing a petition. Please be aware that striking is different from joining the picket lines on your own time. You can join the picket lines before or after school or during your unpaid breaks. 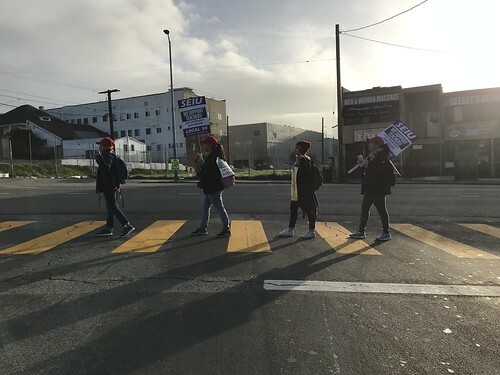 Going on a sympathy strike means you join the picket lines and do not report to work and do not get paid while you are on strike. 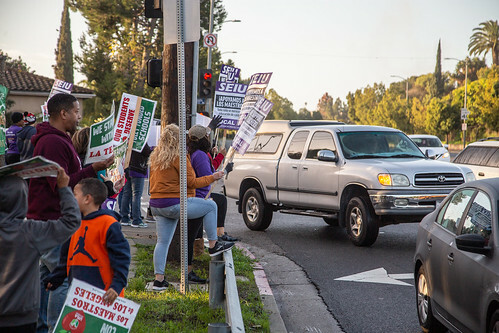 If a strike occurs on Monday, SEIU Local 99 members at several schools are ready to show their support for teachers by joining them in a sympathy strike. See which schools are participating. 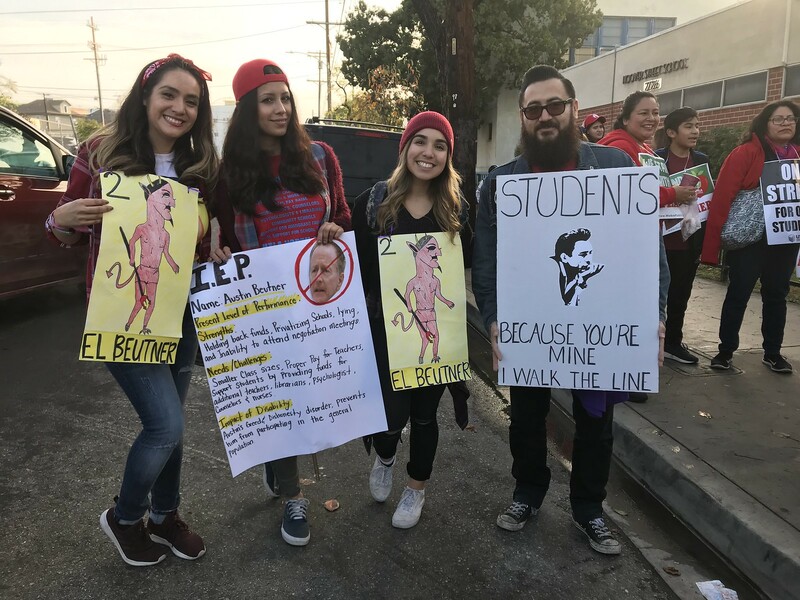 A Los Angeles County Superior Court judge Thursday cleared the path for a teachers’ strike to start Monday, January 14. 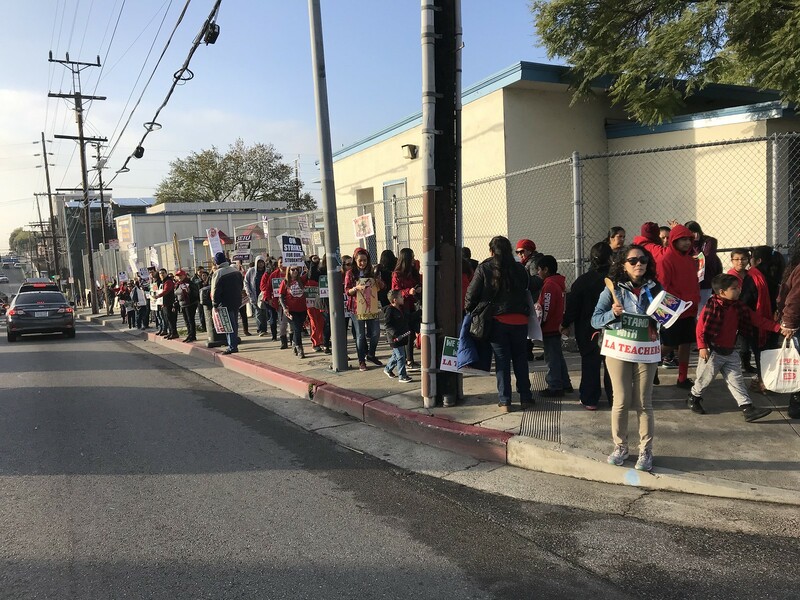 Now that LAUSD teachers have the legal clearance to go on strike, the question is whether UTLA and LAUSD will be able to reach an agreement before Monday and avert a strike. The two parties meet again on Friday. Below are questions raised by SEIU Local 99 members that our union’s bargaining team has been addressing with LAUSD. We understand that now that teachers are on strike, many more questions may arise that aren’t covered here. Contact SEIU Local 99 with those questions. Report any questions, concerns, or violations to the union office by calling 213.637.0296 or report the violation via the form on this page. 1. What should I do if I am given an assignment that requires that a teacher or other certificated staff be present? Clearly tell the principal or supervisor that the assignment requires that a teacher or certificated staff person be present. Ask for the assignment in writing. If the principal or supervisor refuses to put it in writing or give you a new assignment, do not refuse the work unless you believe it is unsafe for you or students or violates the law. If you believe the assignment is unsafe or unlawful, tell the principal or supervisor that you are refusing the assignment because you believe it puts you or students in an unsafe situation or violates the law. Document what happened and report it to SEIU Local 99 immediately. 2. Can classified staff be assigned to supervise students in classrooms, auditoriums, playgrounds or other multi-purpose areas? Under the California Education Code, teachers have the primary responsibility of supervising students on their way to and from school, on the playground, and during recess. This means that non-certificated school employees cannot be assigned supervision duties in the absence of a certificated teacher. Teacher Assistants, Special Education Assistants, Classroom Aides, Campus Aides, and any other SEIU Local 99 member has the right to refuse an assignment if a teacher or certificated administrator is not present. It is the District’s obligation to assign responsibility for class supervision and instruction to an employee with a teaching credential. Our contract also states that “no employee shall be required to perform clearly identifiable struck work of employees of a different bargaining unit.” This means that you should not be asked or assigned to perform any duties that are the responsibility of a teacher, including classroom or student supervision. You have the right to refuse such an assignment by following the steps in question #1. 3. What if I am asked to do work that is outside the duties of my job classification? If you are asked to perform work outside of your job classification and the assignment is safe and lawful, you should perform the work, but document the assignment and report it to SEIU Local 99. You may be entitled to additional pay for the work you are doing. 4. Can Teacher Assistants or any other classified staff be assigned to supervise students in a classroom while directly reporting to “roaming” certificated staff who are not present full time in that classroom? You should not refuse this assignment unless you believe it is unsafe for you or students. You can refuse the assignment by following the steps in question #1. 5. Can cafeteria workers be assigned to supervise students in classrooms or multi-purpose areas? The District has stated that food service staff will continue supporting food service programs and will not be assigned to a classroom. The priority is to feed the students. However, there may be a need to adjust schedules to respond to any meal service changes during the strike. 6. Can a Building & Grounds Worker (BGW) or School Facilities Attendant (SFA) be asked to serve as a security guard or guard the gates? The District has made it clear that securing the campus is not the same as serving as a security guard. Building & Grounds Workers may be asked to secure parts of the campus and attend to the gates. A Principal may also ask a BGW or SFA to secure the campus. If you are given an assignment that you feel is unsafe, you can refuse it by following the steps listed in question #1. 7. Will Maintenance & Operations staff be asked to cut zip ties on gates? According to the District, if the gates are secured in some way, M&O staff may be asked to unsecure them. If you feel the assignment is unsafe, you can refuse it by following the steps listed in question #1. 8. For employees working in classifications that have not been provided training to serve students with special needs, what are the protocols for responding to, and reporting, assignments relating to students’ special needs (e.g. drug administration, toileting, behavioral intervention)? The site administrator will determine how staff will be assigned during a work stoppage. According to the District, the priority will be to have staff familiar with the students with disabilities work with those students. The District also states that all students who require toileting assistance, including students with disabilities (SWD), will be provided appropriate assistance for their toileting needs. If there is a problem, the employee should notify their assigned supervisor, and if not remedied, that person’s supervisor. In case of a medical emergency, call 911. If you are given an assignment that you believe is unsafe or unlawful, follow the steps in question #1. 9. Will non-certificated staff be responsible for special education classrooms? The District and the law both state that all students, including students with disabilities, must have ultimate supervision by certificated staff. If you are given an assignment that you feel violates this provision, refuse the assignment and report it using the steps in question #1. 10. What should I do if I am told to go home because there is not enough work? What do I do if my school or worksite is shut down during the strike? 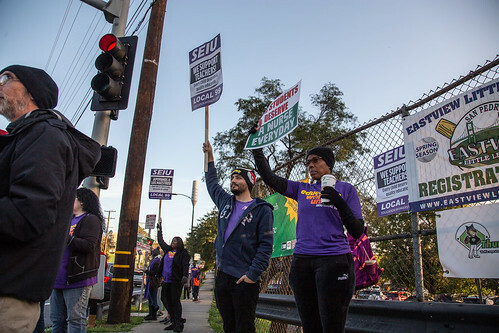 You should follow your supervisor’s direction and go home and report it to SEIU Local 99 immediately. 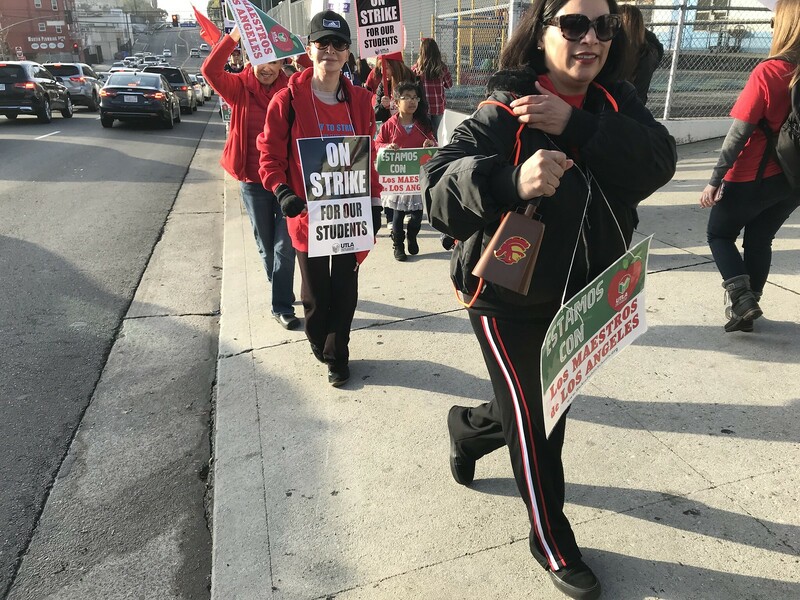 It is our union’s position that during the strike the district should pay you for your regularly scheduled hours even if you are directed to go home or the school is closed. 11. Can I join the teachers’ strike? 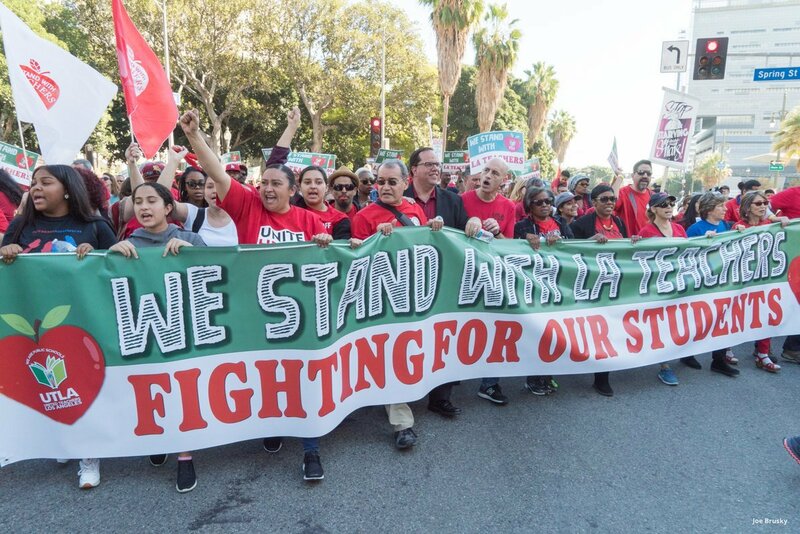 Our contract with LAUSD is currently in effect and, therefore, you should not strike or participate in a work stoppage or work slowdown unless you hear from the leadership of SEIU Local 99 that it is safe to do so. Your job may be at risk if you make the individual decision to strike. 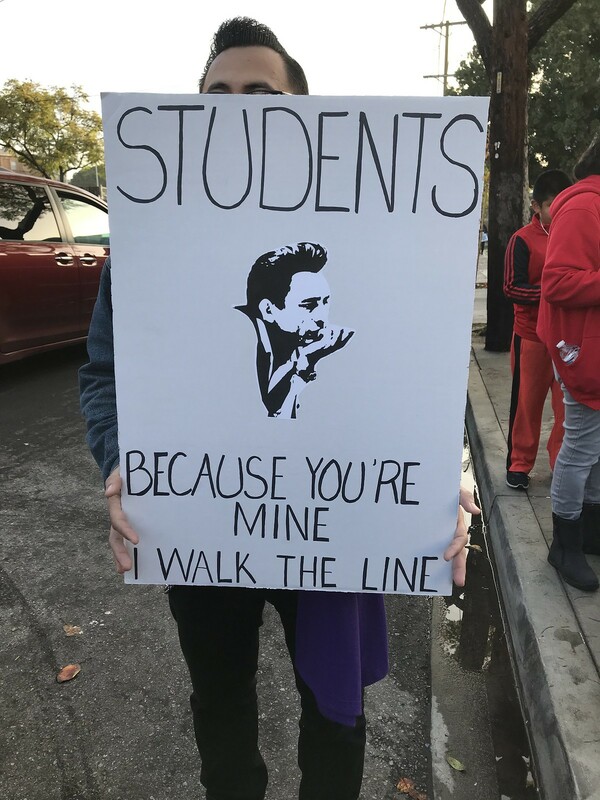 Currently, only members at school sites that completed the sympathy strike petitions by the January 8 deadline can participate in the strike. The list of sympathy strike schools will be posted on seiu99.org/utlastrike. 12. How can I show support for teachers? Wear purple, ribbons, or stickers during the strike. You can also place signs on Local 99 bulletin boards at your worksite and in your individual work area. We encourage you to picket with teachers before or after work or during your unpaid breaks. Be sure to sign out when you take your break to join a picket. If supervisors harass or retaliate against you for supporting the strike, report it to SEIU Local 99 immediately. 13. What happens if I am sick during the strike? You should report your illness to your site administrator. Employees who are deployed to a different work location should contact their supervisor and the site administrator of the work location they are scheduled to report to. You should get a doctor’s note even if you are only out for one day. If you already have paperwork on file for medical leave, such as FMLA or Workers Compensation, you do not need to provide an additional doctor’s note. 14. What if I can’t get into my school or worksite to report to work? You should not have to cross a picket line to get to work. Look for the designated entrance to your school or work site which may not be your usual entrance. If there is no designated entrance or the entrance is inaccessible, call the office (administrator) of the location and let them know you cannot get into work. The office should provide you with assistance. 15. In the absence of licensed pathologists, what assignments will be given to employees working in the classification of Speech Language Pathology Assistant (SLPA)? According to the District, SLPAs will not be providing direct speech and language services during the strike and therefore, do not require the supervision of a Sign Language Pathologist (SLP). SLPAs will be providing “related duties as assigned.” If you are assigned duties that you believe are unsafe or unlawful, follow the steps in question #1. 16. Has Beyond the Bell assigned additional work hours, or changed work locations of any SEIU Local 99 members who work in this program? According to the District, Beyond the Bell programs will operate at all sites until 6pm. Some changes are expected as schools might add shortened, minimum days or have an alternative schedule. The District has offered employees the opportunity to work additional hours if they so choose (work during the school day), but it is not mandated. If there are any issues or changes are necessary, employees should contact the site principal. If the issues cannot be resolved, contact SEIU Local 99. 17. Has the District established any adult-to-student ratios in any setting (e.g., multi-purpose rooms, schoolyards, classrooms)? The District has not established any ratios, but they have said they are committed to having appropriate staff at each site. Each site is different and the principal is responsible for identifying what is needed. 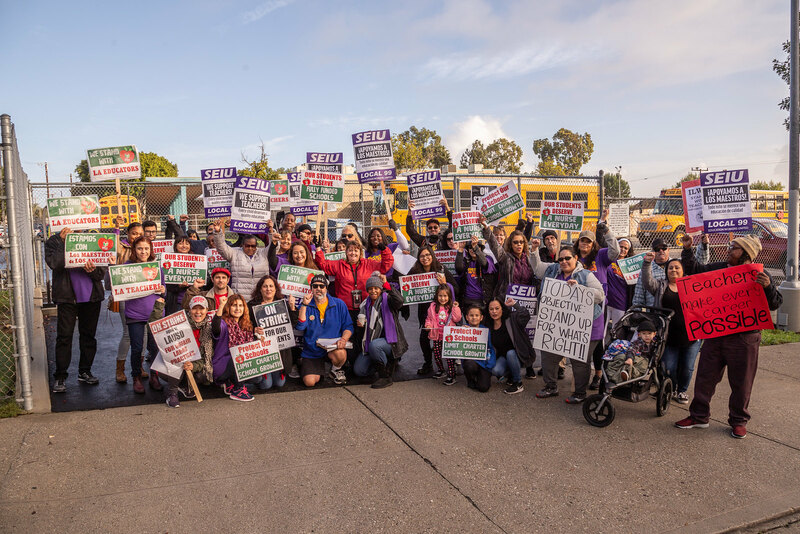 You should address any concerns with the principal first and contact SEIU Local 99 if you feel that the assignment you are given is unsafe for you or students. 18. What are the reporting protocols for Bus Drivers who are not able to safely drop-off and/or pick up students? Scene safety: ensure that the bus is in a safe location and that the passengers on the bus are safe. Notification: immediately notify Dispatch (via radio) and the Area Bus Supervisor. Clearly describe the situation and wait for additional instructions. Identify the person in charge: If possible, identify the person in charge at the scene and follow instructions. Drive to an alternate location: All bus route sheets have an emergency school site identified to be used if drop-off is not possible at the assigned location. 19. For Special Education transportation, who will be at the school site to receive the students? According to the District, it is the responsibility of each site administrator to receive any student who is transported to the school, special ed or otherwise. 20. What is the protocol at sites that receive students? Will there be supervision? 21. I have children who attend LAUSD schools. What should I do if I can’t access the school entrance? Parents should advise the principal of any concerns or issues. 22. What if my child is sick and I need to stay home with them during the strike period? Do I need a doctor’s note? Under the Kin Care Law, you have the right to stay home to care for your sick child. You should contact your supervisor and specifically let them know that you are using “kin care” time to stay home with your child. You do not need to present a doctor’s note when you return to work if you are using kin care time. If you are being asked to teach, supervise, or administer a class of students alone, and/or without a certificated teacher or staff member present. Any assignment that you believe is unsafe for you or your student(s). 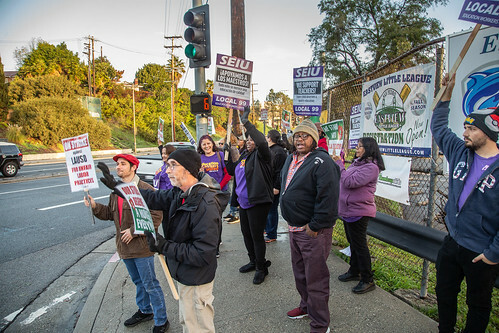 Any threats or harassment by management toward you or any other SEIU Local 99 member. If you are denied lunch or breaks. The district may owe you for time worked during breaks or lunches. 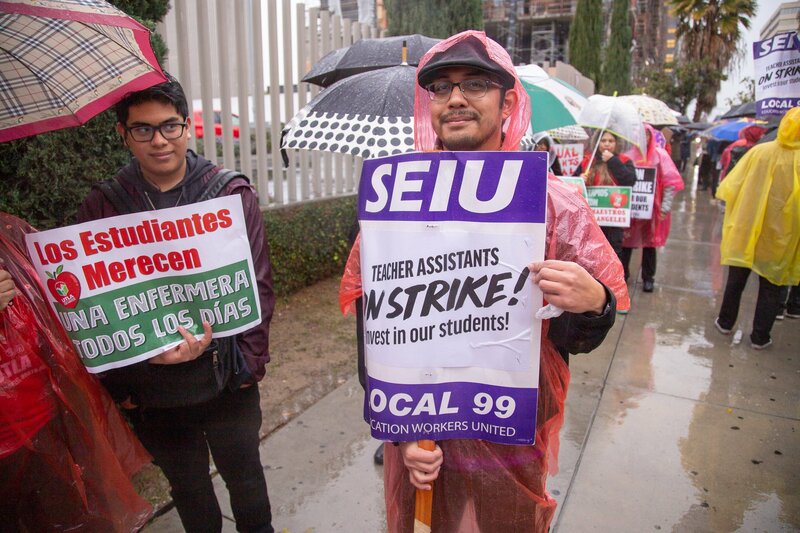 Our SEIU Local 99 Member Resource Center will be reaching out to LAUSD directly to address any issues. Note: This form is ONLY for reporting violations of our contract and district policy related to the UTLA strike. If you have other workplace issues or concerns not related to the strike, please fill out an Inquiry Form. Local 99 will never charge you for text message alerts, but carrier message and data rates may apply. Text STOP to 787-753 to unsubscribe and HELP for more info. What is your job classification/title? What school or work site are you employed at? When did the violation occur? Who is affected by this violation? If applicable, what are the names and titles of people involved in the violation? Enter one name/title per line. If applicable, list the names of any witnesses to the violation. Enter one name/title per line. List their names and titles. Enter one name/title per line. Upload any documentation relevant to violation (optional). To select multiple files on a PC press and hold CTRL and click the files. On a Mac, use the Command key. Don't miss this fun event to rock-the-vote for the LAUSD school board election and Measure EE to invest in quality schools for all. Games, raffles, food! Bring the family! •	If you vote by mail, bring your completed ballot. •	Or register to vote. Forms will be available at the carnival. •	Or sign-up to help mobilize voters. Opportunities will also be available during the carnival. Instructor Delanni Johnson offers an energetic and inspiring workout for Local 99 members.